This very popular “Ika Nui” is the first of its kind in New Zealand. It is ideal for recreational, cross training and tutoring purposes. 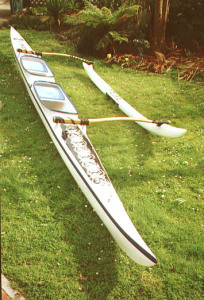 This two persons ocean capable canoe has an optional rudder system and is also made with versatile with steering pedals in the front or back cockpits, enabling you to alternate the steering position. This is achieved by a simple clip system. Spray Skirt Covers can be supplied for the paddler’s who like to keep out of the water no matter what the conditions. “Ika Nui” length 26′ Beam 15 3/8″ Available construction Polyester or Vinyl-ester resin and fiberglass. Carbon fiber of reinforcement.